A lot has happened since our last post, not least being the creation of a completely new website. Back when we set up the first site we used some proprietary Apple products that we now discover don’t have a long term future. After checking with some friends who know about these things, Bill jumped in at the deep end and quickly learned the basics of a programme called ‘RapidWeaver’ to set up this site which we managed to publish today (Wednesday 19th of October). Over the next few days we’ll recreate and upload content (Cake of the Week and Project photos being two significant areas not online yet) as well as generally revamping things. We hope you like the new look and feel. If you have a moment to tell us what you think, that would be great. The build programme is still stuttering along. We had a crisis meeting at the beginning of October and looked at a revised programme that still showed us being able to move in at the beginning of December as originally planned. Albeit the Coffee Shop would not be finished at that point - but we could live with that. Since then things haven’t gone smoothly. The biggest problem has been the sandblasting of the roof trusses and the stone work. That’s a dirty job that needs to be out of the way before lots of other things can proceed.When the contractor turned up he managed to get his compressor across the ford but couldn’t get it up the steep track to the back of the churchyard - the nearest point to our building that his high pressure hoses would stretch to. We are looking into smaller compressors or possibly getting the compressor onto the steam railway and craning it over to the space in front of the school, but we have no definite solution at the moment. The builder tried sanding down the timber by hand but the results were not really satisfactory and it took an age to do it. After a brief demonstration from one of the builders, we started repointing the South wall (21 metres by 2.5metres). We used a lime based mortar which is much kinder to the stone than the horrible black stuff we raked out. Being so close to the path with lots of people passing meant lots of encouraging (and one or two less than encouraging) comments as we worked our way along the wall. The end result is good with that aspect of the building much improved. We finally got permission from the Diocesan Board of the Church to dig a trench along our south wall and backfill it with gravel. This will help prevent damp getting into that low lying wall as well as stopping unsightly weeds growing. We get half of this done before having to stop to allow scaffolding to be erected in preparation for putting the solar panels on to the roof. The builder’s carpenters put new collars onto one of the trusses in the dwelling. 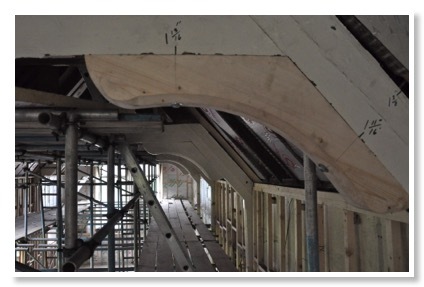 The original collars had been removed when a glazed panel was inserted to form part of a classroom partition. The new collars exactly match the originals and putting them in allows the beam added to the bottom of the truss to be safely removed. This opens up the space at the front of the mezzanine ready for the stairs and balcony to be fitted. We find suppliers for the worktops in the coffee shop servery and our domestic kitchen. The former will be made from Iroko (a sustainable African hardwood) and the latter a manufactured composite made from resin and stone. Bill simplifies the domestic kitchen design. It will be installed by the builder using a mix of manufactured base units and some bespoke items. More of our friends visit to see us and look around the site. On the last weekend of September we find ourselves bobbing about in the North Sea. It turned out that that Yorkshire was the hottest place in England that weekend with a record-breaking 30 degrees. We are pretty sure it was quite a lot colder in the sea. We also manage a trip across to Sheffield to see a brilliant production of Othello at the Crucible. Sheffield born Dominic West plays Iago with a Yorkshire accent, opposite Clarke Peters as Othello.